Tim Moxam refuses to rest. A full-time Carpenter, his quietly dazzling folk-pop arrangements reflect the tireless patience, precision, and quality he brings to his work. And when his work day is done and he starts to sing, the only sensible thing to do is listen. 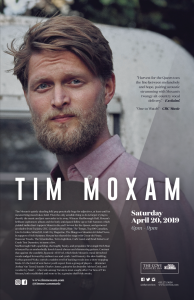 Marlborough Hall, Moxam’s brilliant second full-length album, is the hotly anticipated follow-up to 2016’s Soft Summer, which yielded CBC radio chart-toppers ‘Meant to Be’ and ‘Harvest for the Queen’, while building on the 2013 global breakthrough track ‘Live in the Bedroom’. That track, from his debut EP Blue Son , was featured on the hit BBC show Orphan Black, a fitting backdrop for a performer who lives dual lives. “The worldwide feedback I got from Live in the Bedroom was a real confidence booster,” Moxam says. 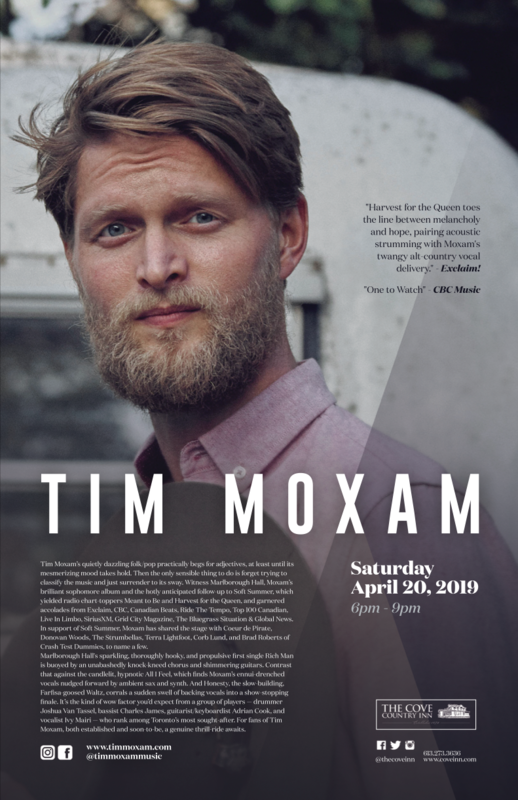 Since then, the one-time member of beloved indie rockers Great Bloomers has played alongside a wildly diverse roster of marquee names including Donovan Woods, Cœur de pirate, Corb Lund, The Strumbellas and Terra Lightfoot, tackling full-scale home renovations in his time off. Marlborough Hall marks a substantial development in Moxam’s work. “Soft Summer was about loss and heartbreak, about being traumatized by love and relationships. Marlborough Hall is about maturity and confidence”, Moxam says. “It’s about coming to terms with who I am and owning that. It’s about honesty.” The album was recorded in early 2018 at Toronto’s Union Sound Company with Chris Stringer, acclaimed producer/engineer behind noted gems by The Wooden Sky, Elliott Brood, and Timber Timbre. Marlborough Hall sees the return of drummer Joshua Van Tassel, bassist Charles James, multi-instrumentalist Adrian Cook and vocalist Ivy Mairi — who rank among Toronto’s most notable players. Originally wanting to name the album Honesty, a title borrowed from another of the album’s nine tracks, Moxam settled instead on Marlborough Hall. “One night spent at the Marlborough Hotel in Winnipeg came to represent an unforgettable moment in my life where I met my ‘destiny’ face to face, and decided to take control of it. Each song on the album represents an incident since that moment where I, confronted with a choice, was unapologetically honest in my decision making. And so, Marlborough Hall has come to represent the pursuit of honesty in everything I do.” A forthright voice does ring clear throughout Marlborough Hall. ‘Rich Man’, the album’s sparkling, thoroughly hooky, and propulsive first single describes Moxam’s frustrations of balancing full-time construction work with a demanding music career. The candlelit, hypnotic ‘All I Feel’, featuring a compelling vocal performance nudged forward by ambient sax and synths, eavesdrops on his negotiations of the terms to the end of a long, faithful friendship. ‘Honesty’, the slow-building “title track that wasn’t” brings a sudden swell of backing vocals into a show-stopping finale and reiterates Moxam’s raw desire for the blunt truth. “The purpose of existence”, Moxam offers, “is to engage in some practice; to produce something”. And so, Tim Moxam offers us Marlborough Hall. Within its walls, we are introduced to a character whose hands are never still, which betray a restless mind that never settles; someone that seeks precision and quality with every pursuit; and who, above all else, demands nothing but the honest truth.